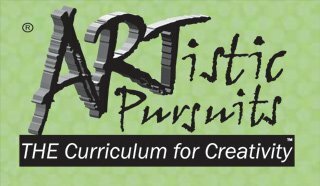 Artistic Pursuits Homeschool Art Curriculum is an award-winning kindergarten, elementary, middle school, and high school homeschool art curriculum. This homeschool art curriculum is designed specifically for homeschoolers. With curriculum for students in preschool through high school, Artistic Pursuits is designed to be student-led, independent art instruction. Since all of the books are non-consumable, a one-time purchase will serve to teach art to the entire family. Once your child can read well, she can work through Artistic Pursuits independently. In this homeschool art program most of the curriculum is written directly to the student with hardly any preparation time required. Which makes it so much easier for the child to become engaged in the activities. There are no pre-required skills. Artistic Pursuits involves the students in the creative process and gives them choices in every lesson, so there is a constant state of interest and anticipation built right from the very first lesson. Basically a piece of art is taught, explained, studied, and then a project is assigned. All you need is the books and good art supplies. Covers art appreciation, art history, artists, and skills. This curriculum is a very hands on way of learning. Preschool children enjoy kids art activities that encourage exploration of art materials and their world. Kindergarten and Elementary art instruction combines art history with hands-on art projects. Middle School and High School art students learn about artists, art history, and art techniques in both drawing instruction and painting instruction. Fun art lessons teach both the expressive and technical aspects of art. Printed in full-color with illustrated instructions and samples of student artwork. Each book has a list of art supplies required both at the beginning and within each lesson. It is offered in 4 levels. : K-3rd, 4-6th, junior high, high school. Books at the K-3 level introduce children to the visual arts and view art through history. Colorful illustrations, art appreciation, and projects are made specifically for for young hands and minds. 32 projects in each book include drawing, painting, printmaking, and sculpture. Sharp color images printed on bright heavy-weight paper, soft bound. Book One at each level provides an overview of drawing, covering the elements of art and composition. Book Two at each level provides an overview of color theory and composition. 64 lessons in each book. Learn technical skills while creating original works of art. Students create a final project using the tools and techniques studied and learned throughout the unit. By Brenda Ellis; Daniel D. Ellis, ed. Art elements and principles such as shadows, source of light, shading, texture, and balance are taught. Students develop observation and application skills. Introduces students to color theory and explores American art and artists. Students apply the elements of art as they learn about balance, rhythm, depth, perspective, and proportion. Most work is done with drawing pencils and charcoal. Students learn hue, value, balance, rhythm, and intensity and study principles related to color. Watercolors are the primary media. Have you used Artistic Pursuits? What do you like about this Art Curriculum? Please include the following information to help...just copy and paste in to your review.